Anne Ishi, marketing director for Vertical, mentions Buddha as a title that did well (well enough to encourage them to localize other, similar titles). This is an interesting statement because none of the 4 volumes of Buddha that came out in 2006 made the bookscan charts for that year (with a cutoff a bit under 5000 volumes sold). Probably helped that the volumes were a few dollars more expensive than similar titles at the time ($15 per, compare with Monster’s $10 per). 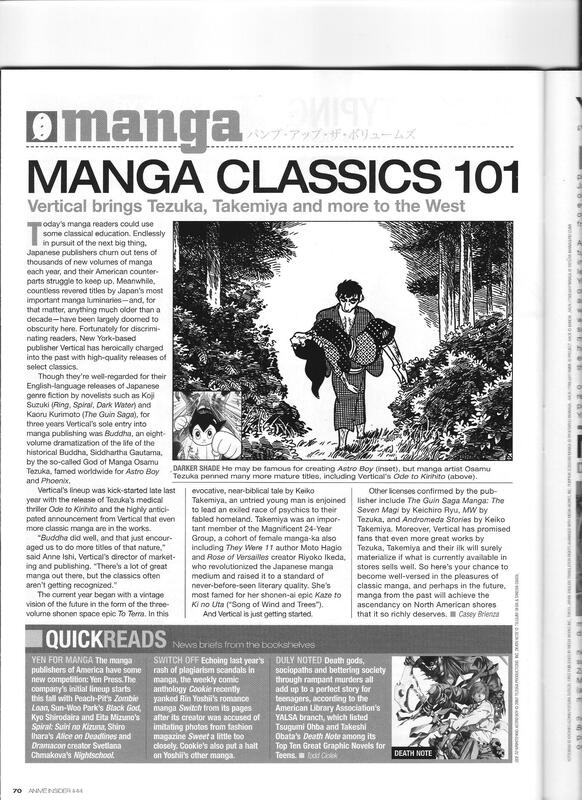 This entry was posted in Old Magazine Articles and tagged Borderline Plagarism for the Freedom of Information, Buddha, Manga, Vertical by torisunanohokori. Bookmark the permalink.